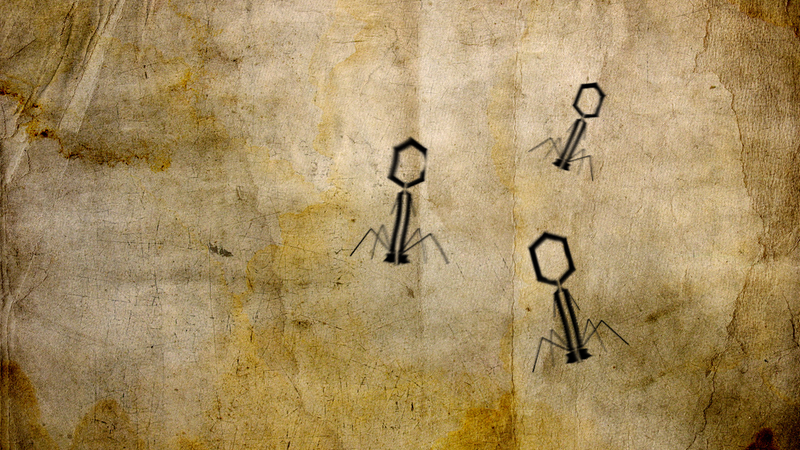 Millions of years ago, our ancestors’ bodies may have waged an epic battle against a virus. Through a sneaky DNA swap, the hosts would have gotten the upper hand, and turned the virus’ defenses against themselves. Researchers think they’ve unearthed the whole ordeal, left like a Dead Sea scroll in our genes. We know very little about ancient and extinct viruses, since they (mostly) can’t form real fossils. But retroviruses, the type of viruses that include HIV, plug their own genetic material into the cells they infect. If a retrovirus infects cells that get passed to offspring, then we can potentially see exactly where and when it was around by looking at ancient and modern DNA. A team of researchers from Rockefeller University did just that, and found what looked like a cunning act of bodily revenge where our extinct hominid cousins used a viruses’ DNA against itself. Viral archaeology is forensic game. The researchers were interested in studying whether there were any examples in history of hosts evolving protection against viruses, and came across HERV-T, a virus that probably left its genetic mark in germline cells, those that get passed from generation to generation including fetal cells, sperm cells and egg cells. That means the researchers were able to look at the DNA of ancient hominids to see whether or not they had HERV, checking out more and more distant cousins until they found one without the viral DNA. The number of years ago that an infected cousin and our ancestors split off on the evolutionary tree tells us about how old the virus is. The researchers also investigated how HERV-T DNA mutated over time, by comparing data previously collected from several old world monkey species’ genomes, like gibbons and bonobos. Like trying to get two different cultures to remember a myth over a very long period of time, minor details change, and differences accumulate between species. The team knew the approximate DNA mutation rates in different species, and used the differences to approximate age of the virus. Basically, the viral intruder had a copy of the key to the house, but left it inside. Armed with that knowledge, our ancestor’s cells changed all the locks. Or, more accurately, they got rid of the doorknobs. The primates with the viral gene would have won the survival-of-the-fittest game, and the virus probably went extinct around ten million years ago. However, it is important to note that one anonymous reviewer of the paper, published today in the journal eLife, had “some concerns with the evidence that the hsaHTenv ORF,” the genetic sequence coding the resurrected protein, “was maintained due to selective pressure.” The researcher didn’t think the evidence that natural selection caused us to continue producing the protein was convincing. Despite this caveat, the researchers’ findings could be a first in viral archaeology. “We’ve known it’s possible for hosts to co-opt envelope proteins to protect themselves from retrovirus infection, but this is the first time it’s been demonstrated in hominids, our direct ancestors,” said Bieniasz. It’s also the first time an extinct virus’ protein has been resurrected. It’s important to note that this is just one study about one protein, and a many million year look into the past requires some degree of speculation—we weren’t around to observe the virus or its effects, after all. The researchers think they might be able to use the protein in cancer research. They think they could make their own viruses stuffed with the ancient viral protein to target and kill cancer cells. It’s unlikely that we’d be able to cure ourselves of other retroviruses, though, like HIV, since most of them don’t infect the germline cells—we wouldn’t be able to pass resistance on to our children, or get all of our cells to develop resistance. Regardless, just think, your DNA essentially contains ancient scrolls with evolutionary epics waiting to be read.